The reconciliation screen lists all Cash In Bank transactions that have been entered into the Frazer System but have not been recorded as cleared. These transactions may come from various sources such as entering a vehicle, added costs or various accounting features. 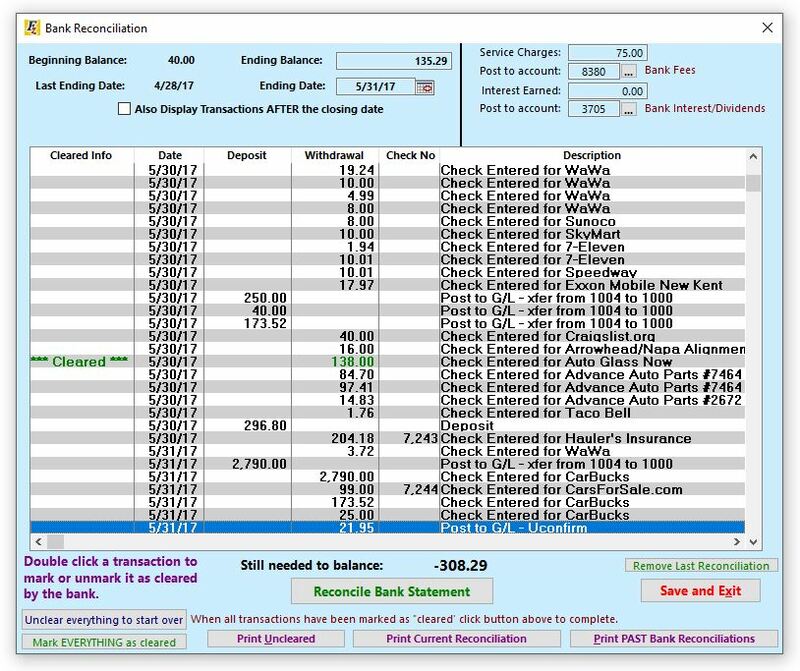 1.Fill in the information at the top of the Bank Reconciliation screen. This information is found on the business's Bank Statement. •Beginning Balance – The beginning balance displayed on your bank statement. The beginning balance is also the ending balance from the previous statement. •The first time that a bank reconciliation is done, the beginning balance should be $0.00. •If you've been using Frazer for a while, you may need some assistance with your first bank reconciliation. Please call us at 888-963-5369 if you do! •Last Ending Date – The previous statement ending date. •Ending Balance – The amount of money that the bank records on the statement as the balance at the end of the statement period. •Ending Date – The end date of the time period on the bank statement. •Service Charge – A fee charged by the bank for having a checking account. Frazer posts this charge to account 8380 Bank Fees. •Interest Earned – The interest earned on the checking account. Once recorded it is posted to 3705 Bank Interest/Dividends. •Also display transactions AFTER the closing date – Displays not-cleared transactions that are dated for after the closing date. 3.Once it's cleared, click on . This will finalize the Bank Reconciliation process. Transactions not marked as cleared by the bank will remain on this list for the next month’s reconciliation. What happens if you click "Reconcile Bank Statement" and you get an error? You may notice that everything seems perfect on the bank rec, but clicking to Reconcile pops up an error anyway. Follow the instructions to contact Frazer at the number listed in the error. You will not be able to complete your Bank Reconciliation until you do. The Accounting department will need to get involved to correct underlying issues with your accounting data.